Tour Description: You will find our tour guide waiting for you at meeting point at the arrival hall of Beijing airport, holding a paper sign with your name on. 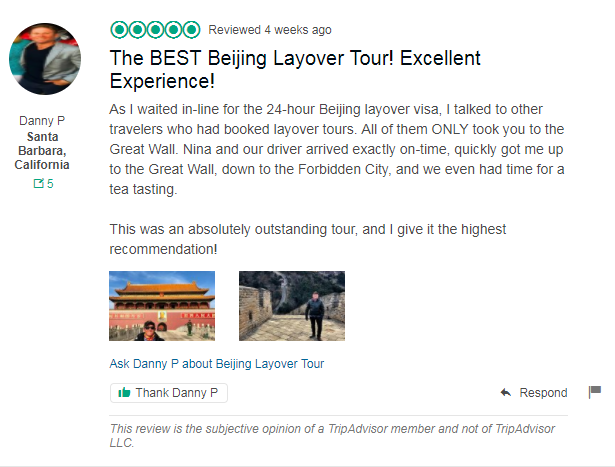 First, drive to the city center to visit Tiananmen Square and the majestic imperial palace-Forbidden City, and then transfer to the Temple of Heaven, a large scale imperial architecture where Chinese emperors held grand sacrifice ceremony to heaven. After the tour, be escorted back to Beijing airport. Thank you for using our service! A friend and I will be arriving at the Beijing airport 6:30 A.M. at Terminal 3 and departure time will be at 4:00 P.M. Will we have enough time for this tour? Yes, according to your layover time, you will have enough time to do this tour. And this is a private tour, you can decide to stay longer or shorter time at each attraction. We just sent you an email as well, please check. I’m planning a trip in late November. I arrive in Beijing at 5:55 PM and depart the next morning at 8:35 AM. That’s about 14 hours. But are the tours available in those times? I suggest you visit Hutong area and Tiananmen Square during your layover in Beijing. 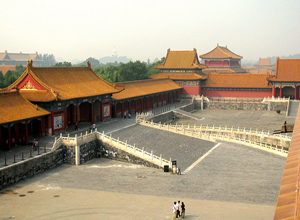 Because your arrival time is too late, most of Beijing attractions will be closed by then. We will send an email about detailed itinerary and price to you now, please check it out.